With an upcoming trip to Walt Disney World, I was excited to try out the new Be Our Guest restaurant. I was unable to secure a reservation at this popular destination for dinner, but I did manage to grab a lunch fast pass reservation. To bypass one step upon ordering, you have the option of selecting your meal in advance. I was curious if this was something that would work for people with basic food allergies, and here is what I uncovered. When you have a fast pass reservation for lunch, you will have the option to choose lunch menus for your party. There is a "Filter" button on the bottom of the ordering screen. 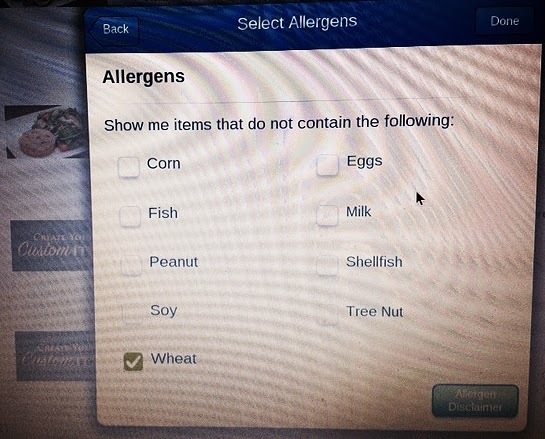 Click that button to see the window titled "Allergens". If your allergens are among this list, then you may feel comfortable pre ordering. 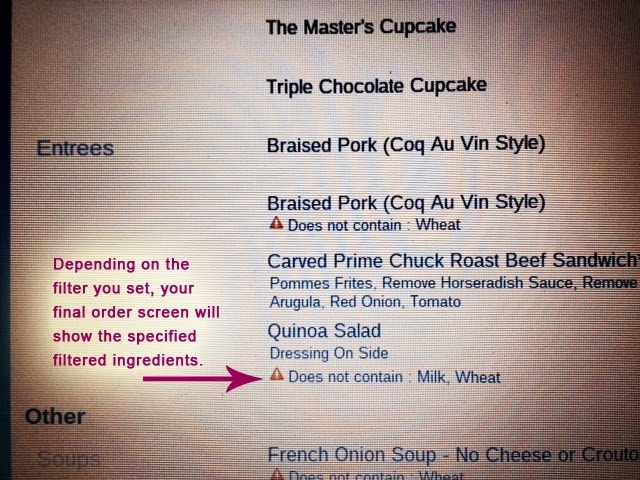 There is an allergen disclaimer at the bottom, and I am sure you are welcome to wait and order at the restaurant where you can speak to a chef and ensure safe meal options. I selected 2 filter items, Wheat and Milk. 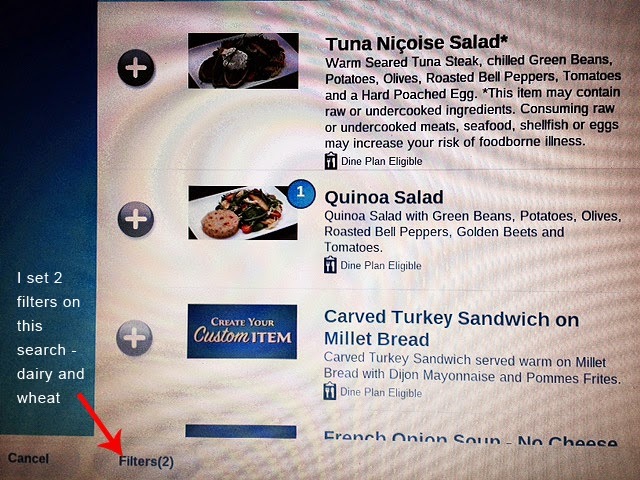 I preceded to the next screen on entrees where I found several choices that would work for those allergy restrictions. I chose the Quinoa salad. By adding the menu item from this "filter" window, it tags the foods as "wheat free" and "milk free" on the summary page to follow. If you order the same entree item without first applying the filters it will not mark it as "wheat free" or "dairy free". So, I would definitely do that step and ensure that label appears (see photo below for orange triangle followed by warning of "Does not contain: Wheat"). While there was a wonderful option for a gluten free dessert, there was nothing that came up as wheat free and milk free. I did find two sorbet options that are marked dairy free and no sugar added (lemon and raspberry). So, for others who were wondering if there is a process for those of us with basic allergens, the answer appears to be yes. However, note that they don't declare "gluten free" or "dairy free", so we will still have to discuss our options with a chef to ensure safety. We look forward to trying out this new restaurant experience and I will definitely come back with photos of our gluten free and dairy free final selections. I am so glad I found this!! I got my invitation today for my trip the first week of December and I was sad because I couldn't order ahead of time. Thank you so much for these instructions! !